600mg! 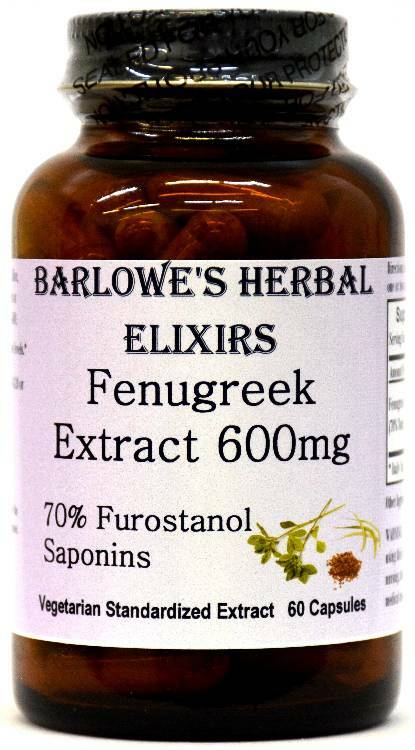 Barlowe's Herbal Elixirs proudly offers you this POTENT Fenugreek Extract standardized to 70% Total Furostanol Saponins. It is especially designed to boost testosterone levels, muscle size and libido. Bottled in Glass! No Stearates! No Fillers! No Junk! 600mg! Barlowe's Herbal Elixirs proudly offers you this POTENT Fenugreek (Trigonella Foenum-graecum) Extract standardized to 70% Total Furostanol Saponins. 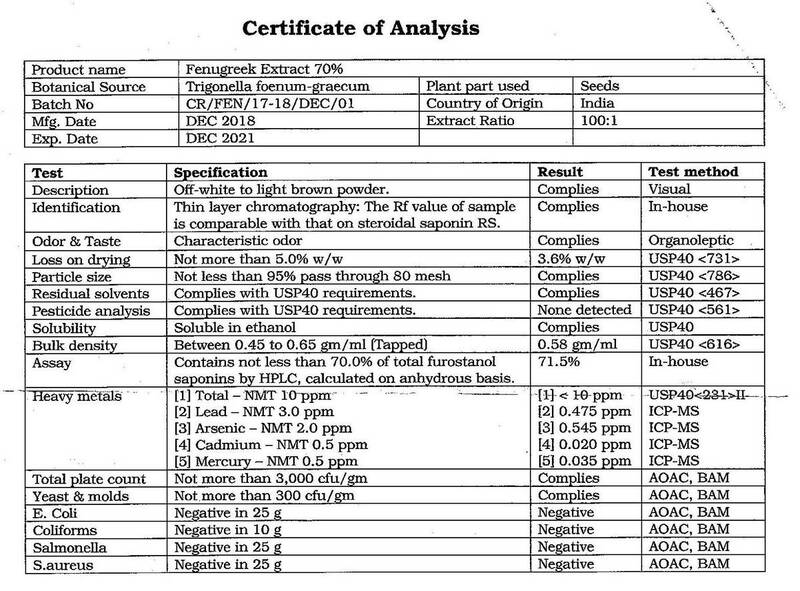 The Fenugreek Certificate of Analysis (COA) for this particular batch is shown above. Fenugreek 70% Extract is especially designed to boost testosterone levels, muscle size and libido. Bottled in Glass! No Stearates! No Fillers! No Junk! Although Fenugreek contains many natural compounds, it is only the Steroidal Saponins which have been shown to be useful for increasing testosterone and muscle mass. In several unpublished studies, it has been shown that the consumption of high concentrations of Steroidal Saponins substantially increases free testosterone in the bloodstream and lean muscle mass. It appears that 70% Fenugreek acts initially as an adrenal cortex stimulant, thus activating the hypothalamus and boosting natural production of corticotropin releasing hormone (CRH). The CRH switches on the pituitary gland, enhancing production of the key adrenocorticotrophin hormone (ACTH). ACTH stimulates the adrenal cortex to increase androgen synthesis. Since androgens are precursors to testosterone and possess "testosterone like activity", 70% Fenugreek naturally supports the activity of the luteinizing hormone, acting as a testosterone booster. 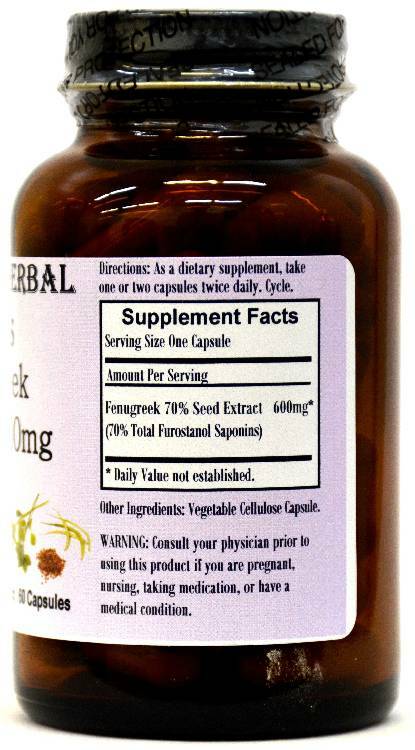 Caution: Barlowe's Fenugreek Extract is generally safe, but it is potent and should be utilized with care. This product is for dietary use. If side-effects occur, discontinue use immediately! The above statements have not been evaluated by the Food and Drug Administration (FDA). This product is not intended to diagnose, treat, cure, or prevent any disease. Directions For Use: Take one capsule two or more times a day on empty stomach. Cycle usage, either two weeks on, one week off, five days on, two days off, or something similar. Results and usage amounts may vary based on body type and weight.